I don’t think it counts as a spoiler to observe that when you pick up a novel advertised as an action thriller and it begins with a happy family doing ordinary stuff, something awful is about to happen. And so it is in Robert Crais’ The First Rule. The man whose life is destroyed here is Frank Meyer, a guy who used to work for Joe Pike as a mercenary. The police inform Joe of this, and question him. The other victims of this particular gang of murderers and thieves have been involved in organized crime, so they figure Frank must have been dirty too. Joe cannot believe that. With the help of his friend and business partner, private detective Elvis Cole, Joe employs his formidable military skills to unravel a scheme involving prostitution, illegal arms sales, and a kidnapped baby. 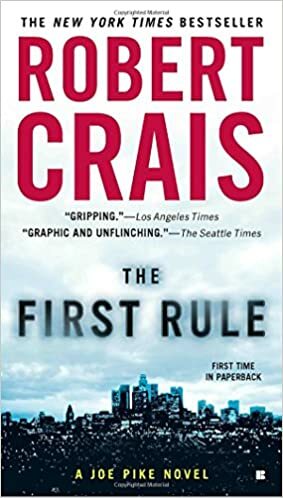 Author Crais has intentionally moved the Elvis Cole series from straight mysteries to action thrillers, which means a bigger role for the mysterious and dangerous Joe Pike. This has been a good move, as Joe is one of those laconic characters – few words and economical but explosive action – who work extremely well in high tension stories. A particular pleasure in The First Rule is the ironic scenes showing Pike’s developing relationship with the rescued baby – all the more touching in contrast with Joe’s cold, focused, almost monastic persona. It occurred to me as I read that there are theological implications here (certainly not intended by the author). Joe is the kind of rescuer every true victim dreams of, though often silently. He does not only inflict violence on evildoers – he is terrible (in the sense of inspiring terror) when he does it. People who live in relatively safe and just environments have trouble understanding the need for a terrible avenger. It’s not enough that the wicked should be slain – they should be frightened as they die. Modern westerners don’t generally understand the aspect of terror that belongs to the just God of the Bible, but the oppressed and the persecuted do. Anyway, I recommend The First Rule for those who can handle the language and violence. First class action entertainment.